There are varying degrees of cold weather when it comes to ice fishing. Some days are really pleasant with decent temperatures and light winds. Staying mobile is a great strategy when the elements allow it. But when it comes to those days of frigid temperatures and howling winds, hunkering down and milking a spot for all it’s worth is the name of the game. Choose an area wisely when it’s time to dig in. I definitely don’t want to be stuck out in the dead sea when it’s too cold to move. I’m going to be conservative and go to an area that I’m fairly certain I’ll be around some fish. I want to set myself up to have some flurries of activity while slowly picking away at them the rest of the day. I also want to select an area that I can make small moves to be in a different depth zone or piece of structure. Lastly, I want my own space and I want those fish zeroing in on the zone underneath me and not any neighbors. So setting up in the middle of a crowd is out of the question. When you camp in one spot you lose the element of surprise, so to be successful you’ll need some tricks and some patience. 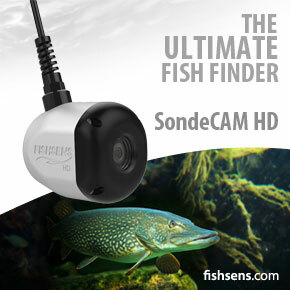 This is also the perfect situation to deploy an underwater camera like a FishSens SondeCAM. Seeing exactly how an individual fish reacts to a presentation is the best way to convince it to bite. It also keeps the entertainment factor up if they aren’t feeding well. You never know what you will see swim by with the camera. Being prepared to switch up presentations will be important too. This is the best time to bring along some lively bait like minnows or wigglers. They can often make a big difference in the number of bites you will get from fish that are really scrutinizing the bait. Lastly, deploy multiple rods especially if you are fishing walleyes or perch. A “dead stick” rod is almost always going to pick up bites from those species and sometimes out fishes a jigging rod. Thermally insulated ice shelters and heaters are the normal in this situation. I’ll also carry a collapsible aluminum snow shovel by Clam to dig myself out a spot and pack the sides of the shanty in. It can be challenging with no snow on the ice, but drill holes until you have enough slush to pack it in. Next time you are faced with brutal conditions take a couple of these tips and hit the ice. Once you’ve braved the trip out to your spot, this is certainly a low-stress and relaxing way to ice fish. Not to mention you’ll be extremely comfortable while putting some fish on the ice.